Wow, what a week it's been! My two poor boys have had some kind of evil bug that has had us running around with well-placed buckets - I'll say no more, you get the picture! So inbetween brow mopping, tummy rubbing, carpet cleaning (oh joy!) and copious laundry it has been SUCH a pleasure to see the massive response to my Giveaway Day (see previous post). How very cheering to get all your encouraging and kind comments from all over the world. 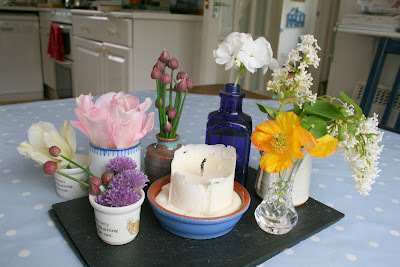 So, for all of you, that have posted and are posting comments, a few flowers...My youngest loves to pick anything/everything that pops up in the garden and sweetly present them to me, hence our table of tiny arrangements. Now then, the postcard request seems to have proved a big hit with many of you, so it gave me another idea (as I was awake a fair bit last night...) for another Giveaway! 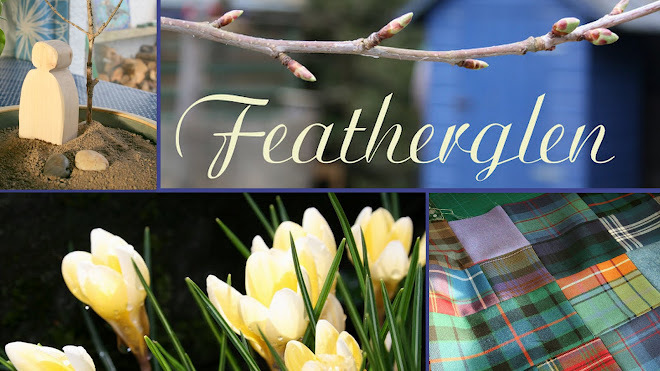 Just to give you a second chance of winning something nice from Featherglen. Please mark 'Postcard' in the subject box. The competition will be open until the end of June, and basically the postcard I like the best will win! And if I can't decide I'll ask the boys to choose. Please be sure to write your name and address on the card, oh and maybe what crafts you enjoy, your favourite colours etc. The winner will get another Featherglen mystery goodie bag, filled with crafty items and wee treats - I'll try and choose stuff that you'll like, plus some Scottish things. And I will send a reply postcard to the next 10 coolest cards. I love to make postcards! I'm sending you an e-mail! in my excitement about the post cards I forgot to say I hope your boys feel better soon! Hotmail is not co-operating at the moment but I will send you an email. It's no fun being sick. I hope the little ones get well soon and tell your littlest that I really like the flowers. It's nice that you have so many little vases to put them in. I'd love to send you a postcard! I want to send you a postcard too! Here's sending good thoughts to your kiddos--and yourself!